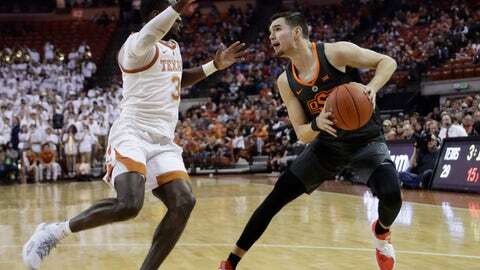 AUSTIN, Texas (AP) — In a Big 12 season of ups and downs for Texas, none was more befuddling than an early loss to last-place Oklahoma State. Texas (15-11, 7-6) led 20-19 before closing the first half on a 19-7 run punctuated by Roach’s 3-pointer from the corner with 1 second left in the half. Oklahoma State: The Cowboys had very little working offensively when Dziagwa wasn’t firing away from long range. They were 12 of 30 inside the arc and went 9 of 18 from the free throw line. Dziagwa was 0-6 when he wasn’t shooting 3-pointers. “Even on a night we make eight (3-pointers) we still don’t get to 60 points,” Boynton said. Osetkowski’s three 3-pointers were his season high. Texas’s deeper bench made a big difference. While Oklahoma State had four players log at least 38 minutes and two — Cameron McGriff and Lindy Waters III — played the entire game, Texas has only two players on the court for more than 30 minutes. The Texas bench outscored Oklahoma State’s 16-2. Longhorns guard Elijah Mitrou-Long had six points and three assists and Royce Hamm Jr. had four points and three aggressive rebounds.